This weekend as we celebrate the 240th anniversary of the birthday of our nation, I remember the words of this old hymn, “God Of Our Fathers”. The text was written by Daniel C. Roberts in 1876 for the 100th anniversary of the signing of the Declaration of Independence. It was written for a small, patriotic celebration in Vermont, and used the music from another hymn. Then in 1892 George W. Warren wrote original music to go along with the words. The hymn praises not only our patriotic feelings but celebrates the presence and our thankfulness for our God who continues to shower us with blessings and asks that He continue to do so far into the future. Read the words and see if you agree they are timeless and are particularly important today. Be thy strong arm our ever-sure defense. Thy true religion in our hearts increase. 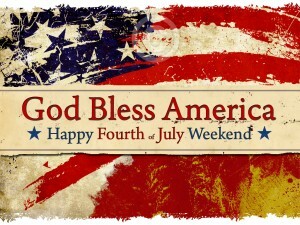 May you all have a safe and blessed July 4th holiday!